11 April 2019 update: The B22 starter kit is £99.99 at Amazon right now. That's a mega reduction of 33% on the £149.99 RRP and the best price we've seen in ages. We have no idea how long the kit will stay at that price so you might want to hurry. If you've been wanting to upgrade your home with some smart lighting but have been put off by the cost, then today is a happy day because Amazon has just slashed the price on the Philips Hue White and Colour B22 Bayonet starter kit and it's making us feel as though Black Friday has come early. This kit consists of the B22 bayonet bulbs – three of them – the Philips Hue bridge and a remote on/off dimmer switch. The Philips Hue bridge is the essential bit and you can't use Hue lights without one. It lets you control your lights via a voice activated AI assistant, the Philips Hue phone app or a dimmer switch. Talking of dimmer switches, you get one in this starter kit. You can leave it in its wall-mounted base (it's held in magnetically) or remove it and use it as a remote control for your lights, switching them on and off, changing the brightness, and cycling through your user-defined colour choices. It's really handy for when you have guests or if you simply don't feel like waking Alexa or your Google Assistant. And then you get those three B22 bayonet bulbs which are both white and colour and offer millions of colours and 50,000 shades of white light. We think that Philips makes the best smart bulbs, both because of their functionality and because it's easy to add more Hue items (a motion sensor, for example) to the network at a later date, and seeing this starter set get a price reduction from £169.99 to £134.95 makes it a particularly good time to buy into smart lighting. Note that if you're after E27 screw-in bulbs instead, the E27 starter set is also currently reduced at Amazon. 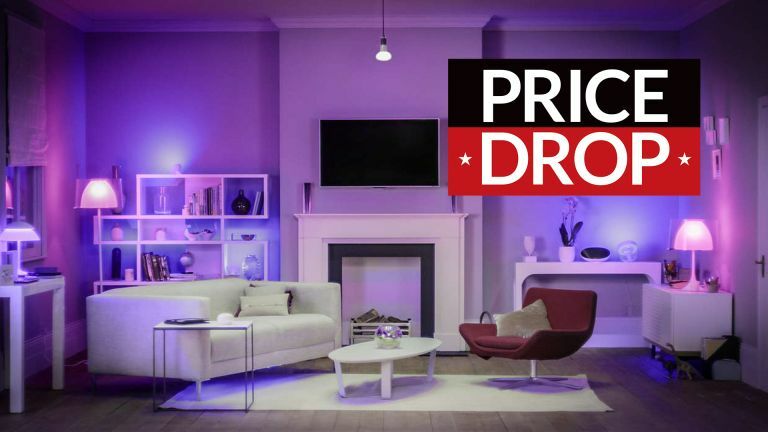 As with most of these deals, we have no idea how long the price will stay this low, so if you want to Hue-ify your home, you might want to hurry.